RoadMap conducts thorough organizational assessments utilizing signature tools developed by RoadMap’s consultants and colleagues, My Healthy Organization (MHO) and Our Healthy Alliance (OHA), and we tailor our services to address the unique realities and needs of each organization we serve. My Healthy Organization helps your organization take stock of its work, structure, and culture, and decide what you want to strengthen for the future. This assessment tool is designed specifically for organizations committed to developing community leadership and making change and is available in two versions: Social Change for organizations doing advocacy and have members and Social Services for organizations providing services to their communities and seeking to engage them more fully. My Healthy Organization is also available in Spanish. Kick off a strategic planning process and get a snapshot of strengths and challenges. Identify what to keep, build, or change. Learn more about My Healthy Organization by going to the MHO website. 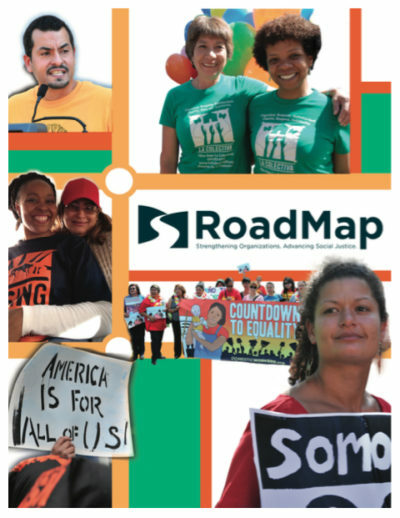 Our Healthy Alliance, a collaboration between RoadMap and Movement Strategy Center, helps alliances assess their strategies to win, their structures and composition, to help lay out a path for their alliance and its members be more aligned and powerful. Our Healthy Alliance is the only assessment tool specifically tailored to alliances seeking to make change and build social change movements. Assess strengths and challenges to strengthen and improve your work. Begin honest and healthy dialogue grounded in the voices reflected in the survey results. Interpret the results with an understanding of how alliances evolve to become more strategic, effective, and sustainable. Learn more about Our Healthy Alliance by going to the OHA website.